In one of the most in-depth studies completed of the Greensburg, Kansas tornado outbreak, researchers from the University of Oklahoma have concluded that the mesocyclone that spawned that tornado may have been much stronger than originally believed. 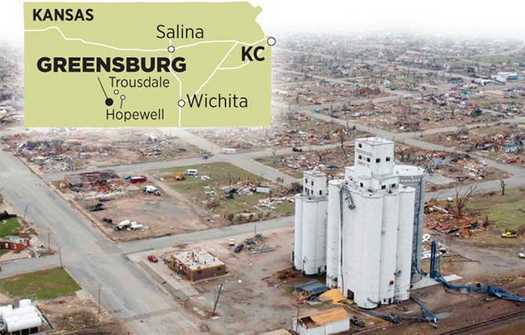 A large, long-lasting tornado 1.7 miles wide and measuring EF5 on the Enhanced Fujita scale virtually wiped Greensburg from the map shortly before 10 p.m. on May 4, 2007. Eleven people were killed and more than 50 others were injured. It was one of 22 tornadoes that touched down in southern and central Kansas from the same thunderstorm complex on the night of May 4 and early morning of May 5. Thatâ€™s more tornadoes than initially thought, said Mike Umscheid, co-author of the study and the meteorologist who issued the â€œtornado emergencyâ€ warning that night for the Dodge City branch of the National Weather Service. A handful of small satellite tornadoes rotating around larger twisters initially went unnoticed. The Greensburg tornado registered at the top of the Fujita scale, with peak winds estimated at more than 200 miles an hour based on damage in downtown Greensburg. The tornado that struck Moore, Okla., and other suburbs of Oklahoma City on May 3, 1999, was labeled perhaps the strongest tornado ever recorded. But research shows the Greensburg tornado had EF3 or stronger damage in a track at least a mile wide â€” at least double the size of the Moore tornado. The Greensburg and Trousdale tornadoes were so intense the weather serviceâ€™s radar in Dodge City detected vortex holes in them â€” something the radar had never done before, Umscheid said. A vortex hole â€œis what you would see in the eye of a hurricane,â€ except itâ€™s in a tornado, he said. They form when winds are rotating so rapidly they pull debris and even large raindrops from the stormâ€™s center. 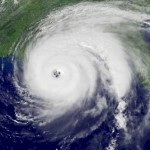 The Trousdale tornadoâ€™s vortex hole was about two miles in diameter â€” or not much smaller than the eye of Hurricane Charley, a Category 4 hurricane in 2004. The outbreak featured something else researchers had never seen before: the mesocyclone â€” or â€œmother shipâ€ cloud from which tornadoes develop â€” was rotating as rapidly as the tornadoes. Typically, the mesocyclones rotate slowly. The Greensburg outbreak featured mesocyclones rotating so rapidly it was hard to tell them apart from the actual tornadoes on radar, the researchers said. Read the complete study by Lemon & Umscheid:Â The Greensburg, Kansas Tornadic Storm:Â A Storm of Extremes. Greensburg, Kansas Photographs Before and After the storm. View a radar loop of the entire mesocyclone.